Insulated packaging refers to the intervening substance that averts the loss of heat or the incursion of sound. The insulated packaging holds a major share in the overall packaging industry owing to its high growth and numerous applications. The rising demand for insulated packaging in emerging countries like India, China and Brazil is attributed to the enhanced economic conditions as well as lifestyles, which is fuelling the growth of insulated packaging industry. Some of the major factors which drives the growth of insulated packaging market are growing concern towards product performance and safety, advancement in the pharmaceutical industry as well as evolving packaging industry. Owing to the advent of digital marketing and online purchase of products, demand for insulated packaging will evolve as it can protect these products from shock, vibration, abrasion, and other detrimental effects of transport and handling. Innovation in the parent packaging industry is also a vital factor for the growth of this market. Moreover, high disposable income of the customers has enabled them to spend more on insulated packaging, which facilitates thermal insulation. The global Insulated packaging market is marked with a strong competition among large number of giant and minor players. The fulfilment of e-commerce sales will be the main driver of growth for insulated packaging which will enhance the use of products like air pillows and protective mailers. Aspects like, growing end-use applications driven by the increasing middle-class population, together with rising workforce enables insulated packaging to be an attractive market of the global packaging industry. Major types of insulated packaging materials commercially available are plastics, wood, glass and more. The report also focuses on different geographic regions and the key countries in terms of changing trends in insulated packaging market in various fields. The market is largely classified based on material type, packaging type, end-user and region. There is a wide spectrum of materials available to provide insulated packaging to a product. These constituents can substitute dry ice in most applications. Dry ice is used for frozen products and is lower in cost than the phase change materials. However, carriers levy a noteworthy surcharge in order to carry dry ice in air shipments since it is a regulated hazardous substance. Insulated packaging finds their applications in various segments like food & beverage, healthcare, personal care, pharmaceutical, industrial and more. 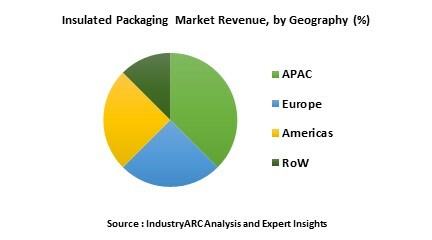 APAC dominated the global insulated packaging market. The industrial development in this region is all set to drive the demand of insulated packaging. Major players involved in this market are mainly concentrating on R&D initiatives and new product developments to cater the needs of customers. APAC region expected to be the largest market for insulated packaging globally. The growth of the manufacturing sector and changing trends in demography are the two major factors that promote market growth in this region. This region is closely followed by Europe, where, increase in E-commerce activities is growing the sales of packaging products during the forecast period. The global insulated packaging market has developed extensively in the few years and this development is anticipated to remain. However, this market for insulated packaging has witnessed a stage of maturity in the developing economies, such as Europe and Americas owing to the high disposable incomes in these regions. Additionally, APAC held the maximum share for insulated packaging, in terms of volume. APAC is anticipated to be the fastest-growing market for insulated packaging during the forecast period from 2016 to 2021. The global insulated packaging market is evaluated based on key attributes such as base materials, application and others. Each of the segmentations in the report has been studied to give comprehensive analysis of global insulated packaging market. The overall market has also been consolidated from the perspective of different geographic locations into standard geographic regions and key economies for this market. Additionally, this report encompasses opportunity analysis, porter analysis, pricing analysis and market forces such as drivers, constraints and challenges that are involved to drive the overall market. Deutsche Post DHL and others.